Bad breath is a condition that seems to occur at the worst possible moment. We’ve all been around someone with bad breath, and unfortunately, probably dealt with it ourselves. Bad breath can represent an embarrassing or uncomfortable ordeal. However, how do you know if you suffer from bad breath? Simply wash your hands and scrape some saliva from the back of your tongue before dabbing it on the back of your hand. Wait a minute, and then lift this area to your nose for a whiff. Is your breath fresh as a daisy? Probably not, but this is a great way to test your level of halitosis. Nevertheless, if you need a bad breath cure and fast, Dr. Andres de Cardenas wants to share some tips for the freshest kiss this Valentine’s Day. It is essential to commit to brushing and flossing your teeth. However, adding in a quality mouthwash rinse could represent the bad breath cure you need before going in for a Valentine’s Day smooch. Brush and floss your teeth after every meal. We recommend carrying around a travel brush and toothpaste so you can brush after lunch. Additionally, clean your tongue as you clean your teeth. The top of the tongue is a place that bacteria like the best, especially near the back of the mouth. The foods you eat also matter in getting rid of bad breath. Crisp, fresh foods serve as an excellent bad breath cure because they naturally clean your teeth. These will include fruits and vegetables like apples and cucumber. These foods also add antioxidants that will help you boost your health. Of course, this includes dental health as well. When you make your selections for your Valentine’s Day meal, keep healthy and nutritious foods in mind. Chewing gum increases the flow of saliva in the mouth. This helps to wash away smelly, harmful bacteria. However, the key to this bad breath cure is chewing sugarless gum that contains xylitol. Xylitol is a natural sugar that will keep your mouth moist. Say goodbye to your bad breath and kiss with confidence during your Valentine’s Day romance! Dehydration is bad. Aside from water representing the sustenance for life, it also helps prevent bad breath. Increase your water intake by sipping it all day. Don’t simply glug down a bottle after a meal. This natural bad breath cure will help keep your mouth clean, as well as odor-free. Bad breath is not simply a matter of preference. This is often an indicator of a more significant problem that may affect your oral and general health. During a dental appointment, your dental professional will check for bad breath as a part of a routine checkup. However, if you experience persistent bad breath and an aforementioned bad breath cure doesn’t take care of the problem, schedule a dental appointment as soon as possible. During a dental appointment, a dentist can professionally clean your teeth while removing harmful plaque. Plaque harbors bacteria, and not only causes bad breath but can damage teeth as well. A dentist can additionally tell you about any cavities, diseases, or other dental issues that remain responsible for your bad breath. Make sure that your breath is fresh when you kiss your Valentine’s Day date. 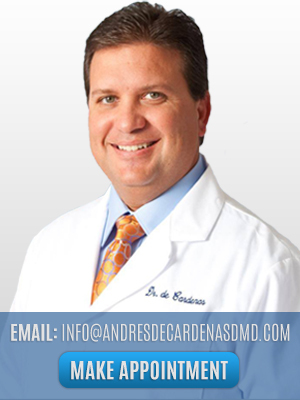 Schedule an appointment with Dr. Andres de Cardenas today!